Assisting You With Helicopter Transfers, Deliveries, Installations, and Surveys. FairLifts schedules helicopters to deliver crews, cargo and perform tours or surveys for both onshore and offshore operations in Lafayette, Louisiana. For over half a century, helicopters have assisted with offshore operations, from construction and crew transfers to renovations and installations. Beginning in the mid-1900’s original pilots all came from their participation in the Vietnam War and were trained by the military to operate aircraft in some of the most grisly conditions including rough weather. This made them fantastic at maneuvering during open water missions to and from rigs off the coast. We work predominantly with some of these veterans of the Armed Forces as well as the oil and gas industry. Experience is often worth much more when it comes to flying in the conditions over the ocean. We pride ourselves on our ability to organize safe, reliable and efficient helicopter services to corporations and small businesses of the petrol industry in Lafayette. Our vast network of partnering operators are located world wide for operations in the Gulf of Mexico, North Sea, Persian Gulf and even the African coasts so whether you are needing helicopter assistance in direct relation to Lafayette offshore operations or if you are starting a new project in another country, we can arrange your professional service and offer you the best aircraft for the job on an on-demand basis. The experience of offshore helicopter pilots make them well suited for any aircraft needed. VFR and IFR operations can be conducted even back to back. While we do offer scheduling of offshore services, we take requests for onshore operations as well. Most offshore transfers for crews are done so in smaller helicopters while those needed for heavy lifting, for pipeline placement for example, are typically much bigger. When making your reservation with us we will choose the right helicopter for your project scope rather than simply place you with the most expensive aircraft. Our vision is to provide our clients with a reliable and efficient option that is both cost-effective and safe. With business being what it is in the Gulf, a near 25% of all domestic oil production, it is no wonder the use of helicopters is needed. Transporting oil products, machinery and parts as well as crews is an on-demand service and must be handled by a professional and experienced pilot. Which is why FairLifts works with nothing less to provide you with efficient, precise and safe offshore helicopter operations in Lafayette, Louisiana. Helicopter services can be scheduled for both offshore and onshore missions. Through our variety of operators, we can offer you the most options in aircraft and services to fit your specific need. Both short and long term contracts are available for any of the following services and we are available to make changes as the scope of your project changes. Each job is different and therefore there is no one specific service that every job fits in. If you do not see your specific helicopter need listed here, please give our agents a call to discuss a tailored solution. Most uses for helicopters in the offshore oil industry can be summed up to crew transport. This type of transport includes platform crews, repair workers, specialty members, executives, partners etc. FairLifts can provide arrangement for these services to offshore installations, remote locations, and for simple base to base transfers. Deep and ultra-deep oil rigs are found as far as hundreds of miles off the coast in areas not easily accessible by traditional means. Taking another water vessel to these rigs can take up a large amount of time and put your crews at risk during their voyage. With helicopters, delivery of work crews to your site is quick, easy, safe and doesn’t put a delay in your work. When you need a specialist to make adjustments or repairs on a rig, you need them there fast. We specialise in the procurement and arranging of personnel transport and passenger handling on-demand. Last minute changes, long term scheduling and recurring transport can easily be accommodated with our professional agents. With constant use, even the newest of oil equipment can need occasional repairs. Shipping heavy components, parts and installing them can be a frustrating process and can also cost you money in the delay of production. 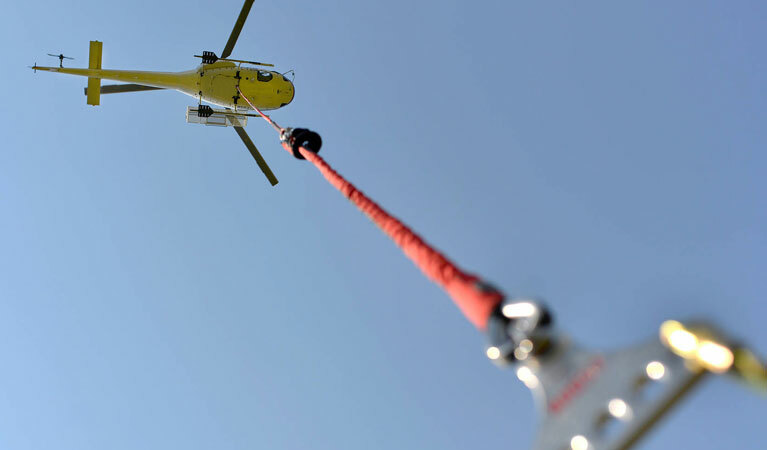 With helicopter lifts and placements, we can schedule an urgent lift to pick up the part and immediately deliver it to the location you need it. Flexible and go-now helicopter lifts can be arranged seven days a week to deliver drilling supplies, sling and production rig equipment. When your crew needs immediate assistance, urgent evacuations or medical attention, the fasted way to get them to shore is via helicopter. The ocean is often unpredictable, therefore evacuations where more than one aircraft is needed can be coordinated as well as individual flights to assist with SAR missions, and medevacs. Emergencies are rarely foreseen and the pilots we work with are flexible professionals who know to be ready to respond at any moment. In recent years, some oil and gas companies have auctioned off their rigs and equipment to those companies in need of more rigs in the same areas as their current groupings. When something such as an auction or sale takes place it is imperative that the buyer see the facility prior to making their purchase. We can schedule potential buyer or investor tours of all Gulf facilities as well as conduct routine inspections of platforms on a regular basis. Our range of services doesn’t stop with offshore operations in Lafayette, as a matter of fact, we can assist companies and individuals with onshore services as well. In the oil and gas industry often, pipeline surveys are needed to guarantee the pipeline constitution as well as in the lifting of repair materials if a new placement is needed. We can arrange for you charter flights to remote areas for inspections and helicopter lifts of refined products to and from facilities where it is needed. Agents are ready to give a complimentary quote for your specific offshore project! When you call FairLifts to schedule your service or to discuss your needs, you will be placed on the line with a specialist who has been trained and experienced in the offshore oil industry. This guarantees that you will speak with the right person every time you call and can discuss your needs with an individual who knows how to address your needs. Our services are available not only in Lafayette but all over Louisiana and can be tailored to fit your specific requirements for aircraft, pilot capability and timeframe. Simply contact us to discuss your needs, for answers to your questions, scheduling and customized quotes.